The beloved Finnish actor Leo Lastumäki died Saturday night January 29, 2012 at his home in Kemi, said Hill-Wood biographer, Sven Pahajoki. Lastumäki was 84 years old. Lastumäki starred in a number of theaters in parts of Finland, including Pori, Imatra, Tampere, Mikkeli, Vaasa and Helsinki. On TV, Lastumäki appeared in series like Pirate Radio, ÄWPK - Älywapaa fire and Ällitälli. 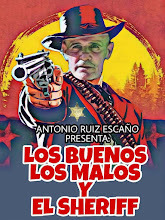 Lastumäki’s movies were mostly comedies, such as Spede Pasanen, Uuno Turhapuro movies including his only Euro-western “Speedy Gonzales – the Son of About Seven Brothers”. His last film role was in “Dog Nail Clipper” in 2004. Leo also appeared in the Finnish northern film “Villi Pohjola” a semi-western. Anne Baxter was born in Michigan City, Indiana, on May 7, 1923. She was the daughter of a salesman and his wife, Catherine, who herself was the daughter of architect Frank Lloyd Wright. At 11 the family moved to New York City. Anne then considered becoming an actress and by the time she was 13 she had already appeared in a stage production and received good reviews. After attending acting school Anne made her first foray into Hollywood in 1937. She was thought to be too young for a film career, and returned to the New York City with her mother, where she continued to act in Broadway and summer stock up and down the East Coast. Undaunted by the failure of her previous effort to crack Hollywood, Anne returned to California two years later to try again. She took a screen test which was ultimately seen by the moguls of Twentieth Century-Fox and she was signed to a seven-year contract. However, before she would make a movie with Fox, Anne was loaned out to MGM to make “20 Mule Team” (1940). Back at Fox, that same year, Anne played Mary Maxwell in “The Great Profile” (1940), which was a box-office dud. The following year she played Amy Spettigue in the remake of “Charley's Aunt” (1941). The other film job Anne appeared in that year was in “Swamp Water” (1941). In 1942 Anne played Joseph Cotten's daughter, Lucy Morgan, in “The Magnificent Ambersons” (1942). The following year she appeared in “The North Star” (1943), where she received top billing. The film was a critical and financial success. But “Guest in the House” (1944) was a dismal failure; “Sunday Dinner for a Soldier” (1944) was received much better by the public. Anne starred with John Hodiak, who would become her first husband in 1947 (Anne would divorce Hodiak in 1953. Her other two husbands were Randolph Galt and David Klee). In 1946 Anne portrayed Sophie MacDonald in “The Razor's Edge” (1946), for which she received an Academy Award for Best Supporting Actress. It would be 1950 before she landed another decent role as Eve Harrington in “All About Eve” (1950). This film garnered Anne her second Academy Award nomination, but she lost to Judy Holliday for “Born Yesterday” (1950). After several films through the 1950s, Anne landed the role of Queen Nefretiri in Cecil B. DeMille's “The Ten Commandments” (1956). After that epic, job offers became fewer as she opted to freelance her talents. 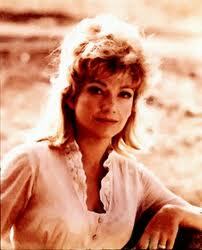 After no appearances in 1958, she made one film in 1959 “Season of Passion” (1960) and one in 1960 “Cimarron”. After “Walk on the Wild Side” (1962), she took a hiatus from filming for the next four years, appearing instead on stage and television. She wasn't particularly concerned with being a celebrity or a personality. In 1966 she took the lead role in her only Euro-western “The Tall Women”. After several notable TV appearances, Anne became a staple of two television series, "East of Eden" (1981) and "Hotel" (1983). Her final moment before the public eye was as Irene Adler in the TV film Sherlock Holmes and the TV film “Masks of Death” (1984). On December 12, 1985, Anne died of a stroke in New York City. She was only 62. BAXTER, Anne [5/7/1923, Michigan City, Indiana, U.S.A. - 12/12/1985, New York City, New York, U.S.A. (stroke)] - producer, singer, TV actress, granddaughter of architect Frank Lloyd Wright [1867-1959], married to John Hodiak [1914-1955] (1946-1953), mother of actress Katrina Hodiak [1951- ]. In Sonora, a small village bordering Mexico, a group of people are preparing to celebrate the upcoming wedding of Captain Ned Carter and Mary Belle Owens. The guests become nervous when someone notices the table has been set for 13 an unlucky number. The suspicion is confirmed shortly afterwards by the arrival of a stagecoach carrying the bodies of the bride and three other passengers. Finding the guilty parties of the crime immediately becomes a priority. The mystery is finally cleared up by two of the guests, Tim and Joe, who, investigating on their own, manage to find out that Ned is responsible for the crimes. It seems that during the time of the Civil War, he had taken possession of a large shipment of Confederate gold, which was then hidden in an abandoned mine owned by the father of Mary Bell. After the war he romances Mary Belle in order to find the hidden location of the gold. He is forced to kill the girl's father, after discovering the secret location. Shortly before the wedding, Ned had had to kill his girlfriend, who, suspecting he was responsible for her father's death, had gone to the authorities and two undercover government agents had accompanied her to the wedding. Ned will pay for his sins, succumbing to the vengeance of one of the guests at the wedding, Tim, who was sincerely in love with Mary Bell. Continuing with locations for “Duck You Sucker”. Sean impatiently waits for Juan to accomplish his task of robbing the bank of Mesa Verde in a nearby alley. This alley is on the right-side of the Plaza de Mayor in Medinaceli as you look at the front of the where the bank façade was located. Maurizio Graf was one of the great Italian singers of the 1960s and 1970s. 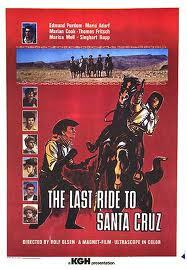 He sang the title songs for several Euro-westerns during the Spaghetti western era. Here are two clips of Maurizio singing "Angel Face" the title song from "A Pistol for Ringo". This first clip is from an Italian TV show in the 1960s. 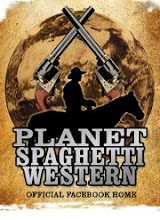 This second clip is from an appearance with the Spaghetti Western Orchestra in England this month 2012. During the French and Indian War Alice and Cora Munro attempt to join their father, a British officer, stationed at Fort William. 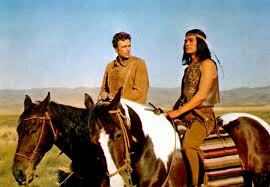 They are aided by Chingachgook, his son Uncas and a frontiersman known as Hawkeye. The party is set upon by French soldiers and their cohorts, Huron tribesmen led by the evil Magua. I was an Italian actress born in in Rome in 1935. I appeared in over 20 films, two being Euro-westerns. I was married to an Italian producer until my death in 2007. Chris Casey correctly guessed this week's photo as that of Leonora Ruffo. Vadim Glowna died, according to his agency after a short illness. 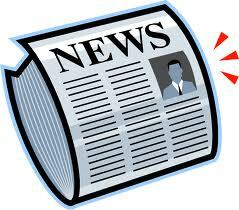 The actor Vadim Glowna has died in a Berlin hospital on January 24, 2011 after a short severe illness, he was 70. Glowna is considered one of the most prominent German character actors who also celebrated successes abroad. He worked with Claude Chabrol, Romy Schneider and Klaus Kinski. 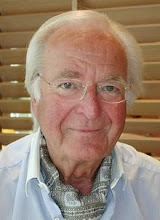 Although he has appeared in more than 160 films in a wide repertoire, he is regarded by many as the "Böser vom Dienst". His lived to play the roles of outsiders: Such people embody "a remnant of freedom," he said. Culture Minister Bernd Neumann praised the deceased as a versatile character actor. "The German film and theater world has become poorer by his death as an extraordinary actor." 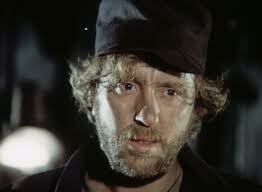 His film debut was in 1964 in Johannes Schaaf Glowna "Im Schatten der Großstadt" (In the shadow of the big city). It was followed by "Gruppenbild mit Dame" by Heinrich Boll, the author of the film "Germany in Autumn". In 1985 he was the senior teacher in the ARD version of the story "Runaway Horse" by Martin Walser. It was followed by numerous other productions, including "The Untouchables" starring Hannelore Elsner. Internationally, he excelled with movies such as Chabrol's remake of "Quiet Days in Clichy" and Sam Peckinpah's war film "The Iron Cross." His only Euro-western roles was that of Brian Jones in the TV film “The Lost Gold of the Incas” (1977). Again and again he returned to the theater, most recently to the German Theatre in Berlin. There he starred alongside Angela Winkler in "Mother Courage". Glowna was at one time married to the Russian actress Vera Tschechowa [1940- ] from 1967 until the late 1980s. Pedro Ortiz has been sitting in prison for the past ten robbery of a gold shipment. After his release he wants to raise the previously hidden loot and exact revenge on the sheriff who put him in jail. 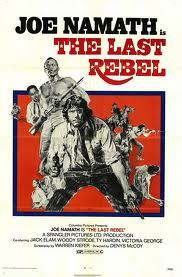 For the job he frees his cellmates, some very nasty criminals, and they begin the bloody trail of revenge. He finds that ex-Sheriff Rex Kelly now works in a bank. Ortiz kidnaps Kelly’s wife and son and keeps them hostage in a Santa Cruz mountain hideout. Kelly pursues the outlaws and there he faces a showdown between the two mortal enemies. "Son, why did you skip school?" The First half of the sixties, again and again, teachers in schools in Colmenar Viejo helplessly witnessed the arrival of unbeatable rivals to capture the attention of their kids: none other than Hollywood superstars Kirk Douglas as Spartacus or Charlton Heston in El Cid made the people crazy with its battles during weeks of filming, and making their own stunts in a freak show for the neighbors. When it was the “Western’s turn, the classrooms were empty, like a dried bush blowing in the wind. 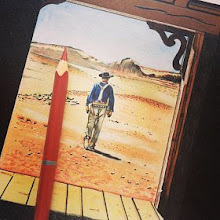 The cowboys and Indians are a favorite of Spanish children, and under no circumstances did pupils want to miss the shooting of "The Man with No Name", also known as "El Manco ', the tough cowboy played by Clint Eastwood in" The Dollar Trilogy", by Sergio Leone. 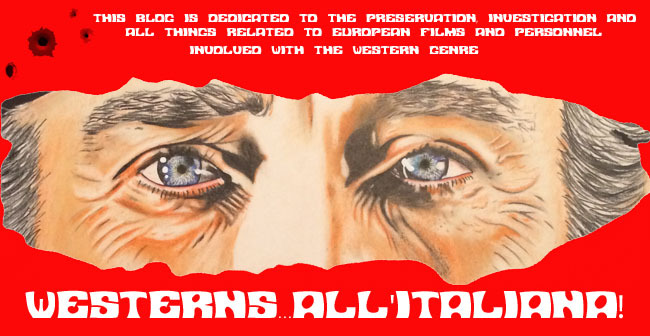 The spaghetti westerns were shot in Spain with Almeria, as their headquarters. In la Dehesa de Colmenar de Viejo Navalvillar was built the town of Michelena-Lega torn down in 1973 by the construction of a military heliport, a stage for mass duels to the death and tavern fights, which became the towns of White Rocks in "For a Few Dollars More" and Peralta in "the Good, the Bad and the Ugly." 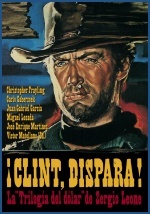 This illustrious cinematic history of the town will be remembered today in the presentation of "Clint, dispara! La Trilogía del dólar de Sergio Leone" (T & B Publishers), 400 pages with facts, anecdotes, drawings, original photos of the shooting and other graphic unpublished materials relating to the work of Sergio Leone with Eastwood in this and other villages. 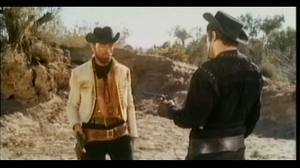 The shooting of the whole ‘Dollars’ series led to many encounters between Eastwood and Colmenareños, who told of some of their comic discussions with Leone. "No, no, not like that ...You must shoot three times, Clint! "Shouted the Italian filmmaker in a sequence of a duel to four of the people watching. "I did shot three times, but you must not have seen me," said the actor showing Sergio his gun cylinder, which proved that his trigger finger was too fast for the eye of the camera. This is just one small but very endearing story that occured during the days of Eastwood in the mountain town, many of which will be remembered in today's event (at 12.30 p.m. in the department store El patio de la Sierra) the entire area of Colmenar Viejo was a set of some of the most celebrated films in cinema history, also showing will be an exhibition of original "props" from the same local, and the presence of the actor Paco Valladares, who gave the Spanish voice for Manco's character in the Spanish dubbed version of "the Good, the bad and the Ugly." 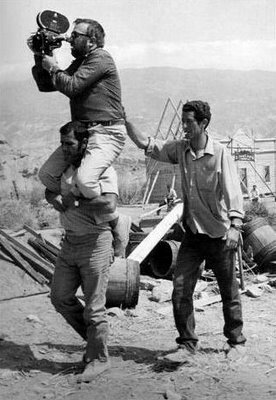 Also the Spanish assistant director Julio Sempere of these films of "For a Few Dollars More", Julio Sempere and set decorator "For a Fistful of Dollars", Jose Luis Galicia. The book, written by Víctor ‘Benito’ Matellano García, the grandson of screenwriter and assistant director Victor Matellano, and who acted as an extra in "El Cid", also reviews other people of the region of Manzanares el Real and Hoyo de Manzanares, where some of the most iconic scenes from the first episode of the series, "A Fistful of Dollars" was shot - and other nearby towns like Aldea del Fresno, where a branch of Alberche River was turned into the Rio Grande for the sequence of the slaughter of the Mexican soldiers in "A Fistful of Dollars." 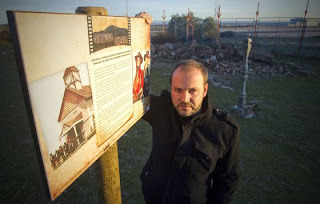 This extensive and ambitious work has also received notes from contributors such as Sir Christopher Frayling, the highest authority on the cinematography of Sergio Leone, and the Italian Carlo Gaberscek, Eurowestern specialist on locations, who did not hesitate to participate in the project sponsored by the association "Colmenar Viejo, Film Land." Born on January 25, 1927 in San Francisco, California, Gregg Palmer started out as a radio disc jockey, billed under his given name of Palmer Lee. He launched his film career in 1950, usually appearing in Westerns and crime melodramas. During the 1950s, he could most often be seen in such inexpensive Sci-fi films as “The Creature Walks Among Us” (1956) and “Zombies of Moro Tau” (1957). Before his retirement in 1983, Gregg Palmer logged in a great many TV credits, including a 13-week stint as a Chicago gunman named Harry in “Run Buddy Run” (1966). 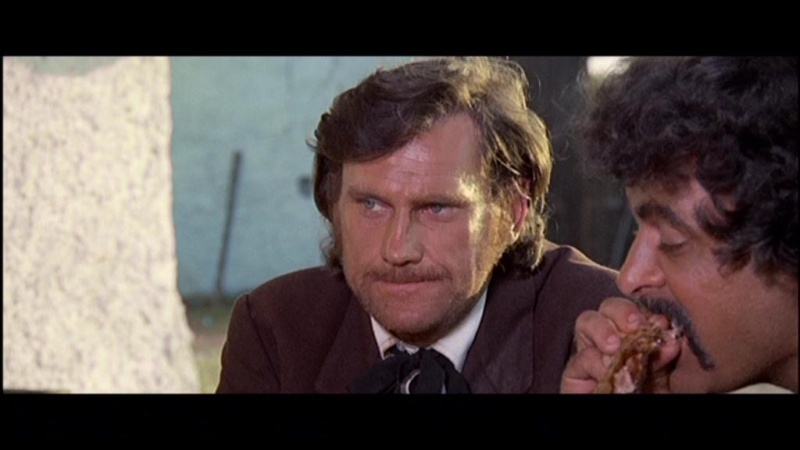 Gregg appeared in two Euro-westerns “They Call Me Providence” (1972) and “Here We Go Again, Eh Providence?” as Hurricane Kid Smith co-starring Tomas Milian and credited as Gregg Hunter. Gregg has remained active in retirement and can be found at film conventions and as a public speaker. Today we celebrate Gregg Palmer’s 85th birthday. It's 1865 in Missouri and the Civil War has just ended. Confederate soldiers Hollis Burnside and Matt Graves flee from Union soldiers that want to imprison them. Hollis then frees a black man named Duncan from a lynching and they become a trio. Later when Hollis wins a lot of money at the pool table and Matt doesn't get any, the two soldiers become enemies. This leads to a showdown between Hollis and Duncan against Matt and the henchmen he has put together to steal the money. Ermes Effron Borgnino was born on January 24, 1917 in Hamden, Connecticut. In recent decades he's been one of America's finest over-actors, but long ago Ernest Borgnine was the real deal. He was Fatso in “From Here to Eternity” (1953), got beaten up by Spencer Tracy in “Bad Day at Black Rock”, and won his Oscar for playing the sensitive butcher in “Marty” (both 1955). Borgnine is best known as Lt. Cdr. Quinton McHale on TV's “McHale's Navy” and two 1960s movies spawned from the sitcom (“McHale's Navy” and “McHale's Navy Joins the Air Force”). He was also the voice of "Mermaid Man" on TV's “SpongeBob SquarePants”, ‘Carface’ in “All Dogs Go to Heaven II”, and the first "center square" on Hollywood Squares when the game show first debuted in 1966. He was married to Katy Jurado [1924-2002] (1959-1963) and Ethel Merman [1908-1984] (1964-1964) and presently Tova Traesnaes [1941- ] (1973- ). 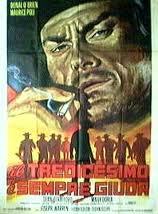 Borgnine appeared in five Euro-westerns including “A Bullet for Sandoval” (1969) and “Hannie Caulder” (1970). Today we celebrate Ernest Borgnine’s 95th birthday.